There are several reports that measure different aspects of freedom. Freedom House assesses political freedom. The Economic Freedom of the World reports measure the degree of economic freedom worldwide. Reporters without Borders publishes an index on press freedom. However, these reports are limited to one component only and do not address the complexity of freedom. 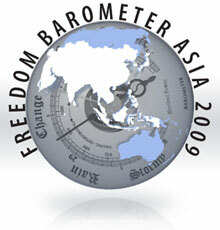 To address the need for a more comprehensive picture of freedom from a liberal standpoint, the Friedrich Naumann Foundation for Liberty Southeast and East Asia introduces the Freedom Barometer Asia 2009. The information for the Freedom Barometer is based on data from Freedom House, Reporters without Borders, Transparency International and Economic Freedom of the World reports. The Freedom Barometer Asia evaluates the 15 countries of Southeast and East Asia: Brunei, Cambodia, China, Indonesia, Japan, Laos, Malaysia, Myanmar, North Korea, Philippines, Singapore, South Korea, Taiwan, Thailand and Vietnam. Of these countries, only 11 have full data sets. North Korea, Laos, Brunei and Cambodia have no data on economic freedom. The results are as follows: Japan is the freest country in Asia followed by Taiwan and South Korea. All three countries are solid democracies with relatively free economies. Vietnam, China and Myanmar are the three lowest ranked countries. Not surprisingly, two of these countries are socialist and the other is ruled by a military regime. Due to its origin, the first edition of the Freedom Barometer only analyzed Asian countries. However its methodology makes it transferrable to other regions. It is a valuable addition to the debate about the different dimensions of freedom and the possible complementarities as well as possible tensions between them. View the complete paper here.